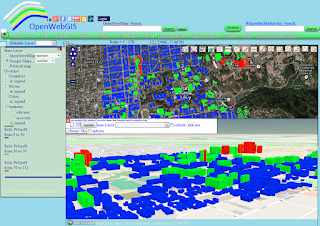 OpenWebGIS version 2 is an open source web-browser based Geographic information system (GIS). OpenWebGIS 2 continues to develop. As has been announced now the second version of OpenWebGIS is created based on OpenLayers 3 (OL3). Version 1 of OpenWebGIS (old interface system, new interface system) uses OpenLayer 2 (OL2). Thus the code base of OL2 and OL3 is totally different (new event handlers, etc). so migration pretty much means full rewriting of source code, so the work moves slowly. 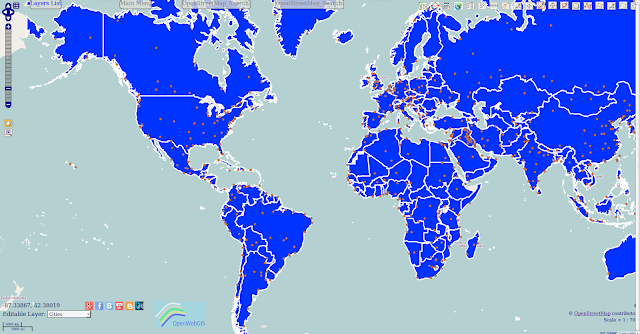 The main purpose of OpenWebGIS 2 is the transformation of this GIS on the modern software basis for modern browsers and mobile devices with touch screens, to increase speed, fix issues of the previous version and create new opportunities for users. 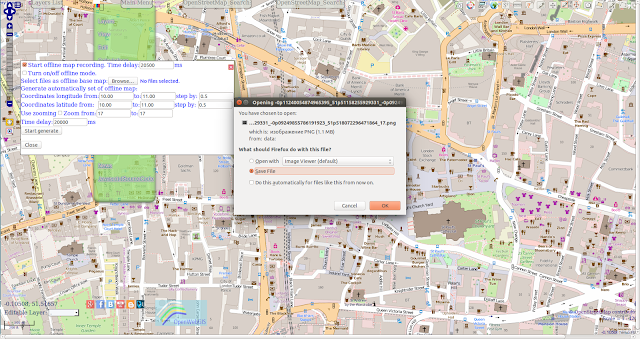 At this stage OpenWebGIS 2 is an editor for adding, styling and exporting of vector layers in various formats. The main menu in the expanded view is shown in Figure 1. There is a geolocation feature through which you can get your positions in the form of a set of points, there are problems with the tracks drawing that will be solved soon. Also there may be some possible problems with getting geolocations in the latest versions of browsers (Geolocation API Removed from Unsecured Origins in Chrome 50). The source code of OpenWebGIS 2 you can get on GitHub. Source code of version 1 OpenWebGIS you can get on GitHub and also version for Android (source code for Android and APK file for Android OS). 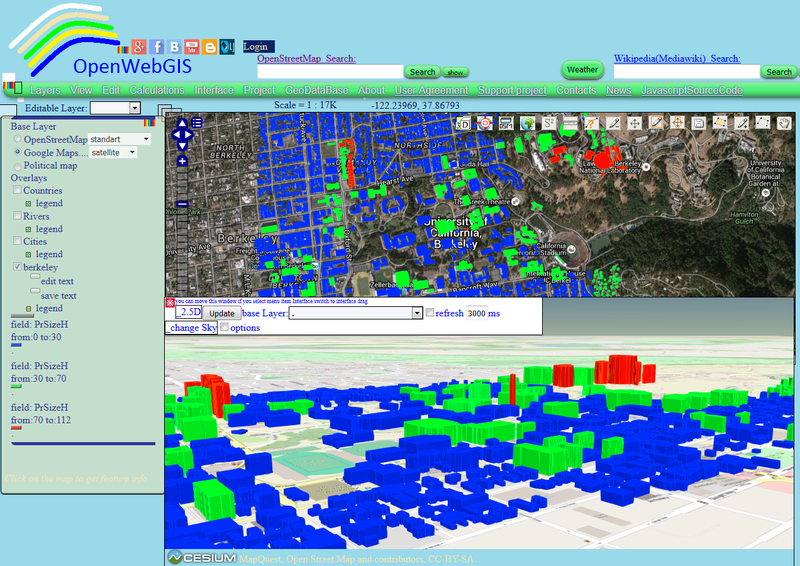 You can find detailed information about OpenWebGIS features and applications on our blog and at the opensource.com. 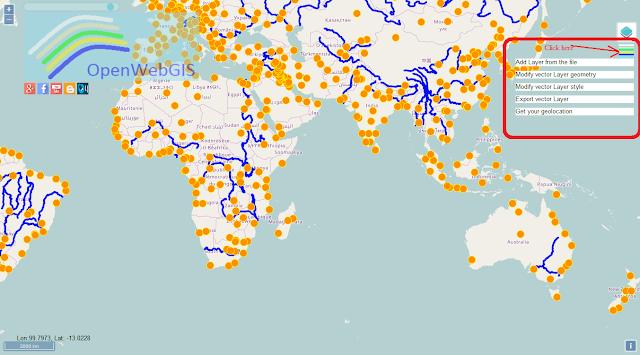 The OpenWebGIS blog and a full list of articles about OpenWebGIS provide a lot of information about possibilities and specific features of OpenWebGIS. 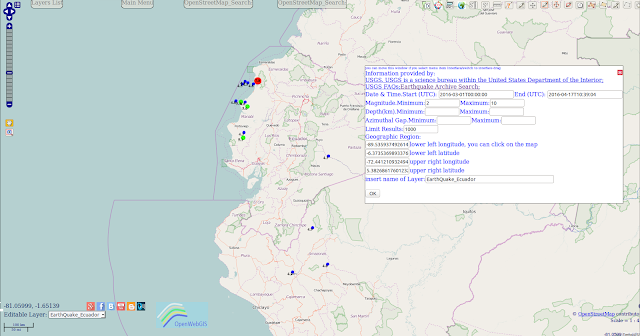 OpenWebGIS is running again after moving and a long period of non-working and you can use this free and open, browser based geographic information system (GIS) at the usual link. Besides earlier announced plans on system developing (read about it also at Digital-geography.com and Geoawesomeness.com) OpenWebGIS team sets the new goal to explore the possibility to use the new library version of OpenLayers 3 (now in the core of the system OpenLayers 2 is used). The result of the first experiments is available at the link ( it will be updated, please follow the changes). This experimental version we will call OpenWebGIS 2. While the version OpenWebGIS 1.0 still is the main, actual and constantly supported. 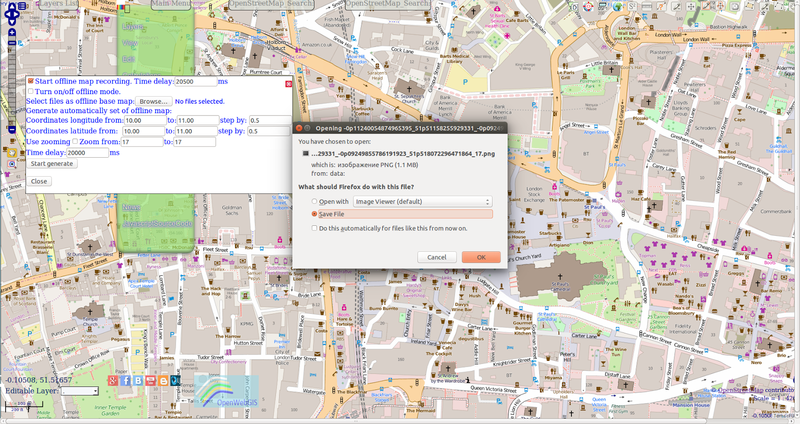 This OpenWebGIS 1.0 version should be used for your diverse tasks in cartography. Last month OpenWebGIS was working in the test mode, now it is fully functioning, but there are still some small technical problems - sometimes the system can be online unavailable. In this case you should wait for a while and everything will be alright. 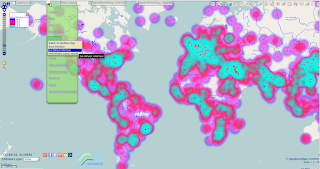 You can use source code OpenWebGIS for your projects. Copy and use it, it is possible to use the OpenWebGIS without having to connect to the server of OpenWebGIS and even without Internet connection. For doing this just download OpenWebGIS source code from GitHub or version for Android (source code for Android and APK file for Android OS). 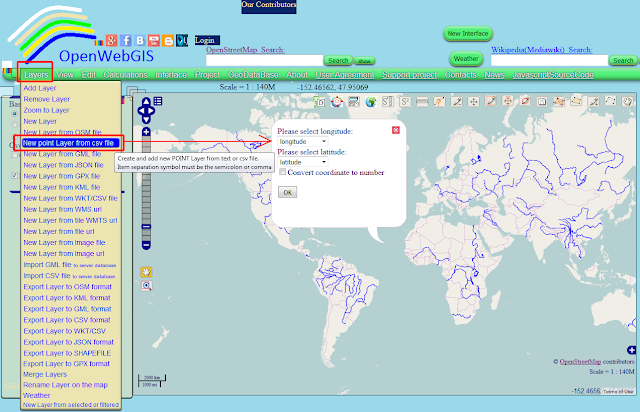 OpenWebGIS has new version of the interface. It is activated when you click on the «New Interface» button. The OpenWebGIS team sincerely thanks everyone who uses our system, supports us, helps with their advice, and publishes information about OpenWebGIS. We hope to continue cooperation. The OpenWebGIS server is physically moving to another location. Besides the system will perhaps get another domain name and (or) it will use the web hosting service. Or for the users perhaps everything will remain as it was before. But in any case for some time OpenWebGIS at the link http://opengis.dlinkddns.com will be unavailable. It is not known how much time it will take to solve all these questions. It will be announced later. But you can always (any time) and without limitations use OpenWebGIS local version, which is available for downloading from GitHub https://github.com/openwebgisystem/OpenWebGIS. We apologize for any inconvenience caused to our users. Almost in every Geographic information system (GIS) there is an opportunity to create maps (vector map layers) from files in CSV format. So CSV (Comma-separated values) file stores tabular data, that looks like numbers and text, in plain text. Each line of the file is a data record. Each record consists of one or more fields, separated by commas. In addition, the term "CSV" also denotes some closely related delimiter-separated formats that use different field delimiters. It is easy to add the data from such a file on a map, when it contains the information only about points and their attributes. In this case one field contains the longitude of the point, and in another field there is the latitude of the point. So according to the rules of every particular GIS, it is necessary to specify which fields are the fields with coordinates, then press "OK" button and here we get the map. We will tell how to do it with the help of QGIS and OpenWebGIS - Free and Open Source Geographic Information Systems. 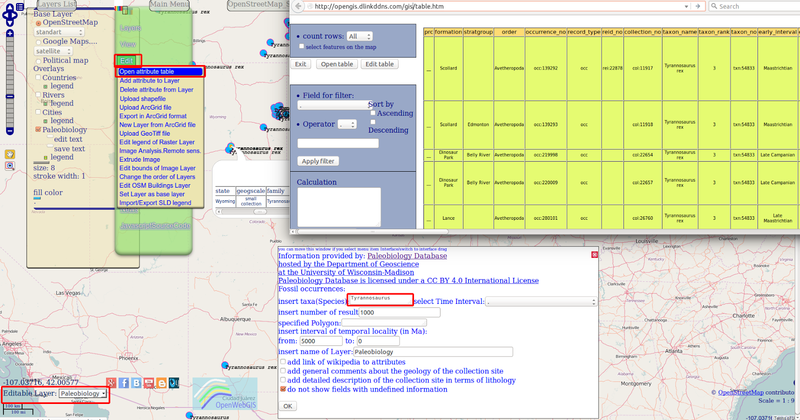 In OpenWebGIS it is done as shown in Figure 1 and 2. To do it - you can select menu item "Layer->New point Layer from csv file". First it is necessary to select CSV file with the help of "Browse" button, then fields with longitude and latitude. 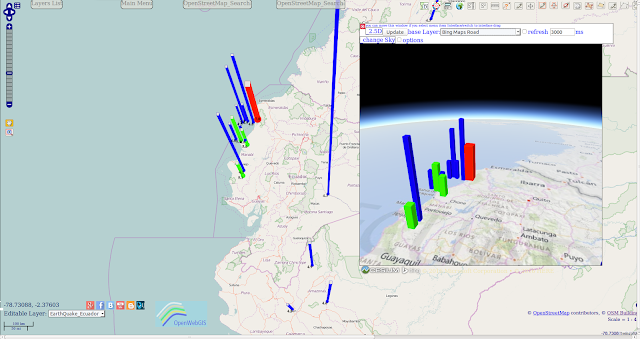 Initial data on earthquake was selected from the database of "Earthquake Archive Search" with the help of menu item in OpenWebGIS: "GeoDataBase-> Earthquakes Database". lower left longitude: -89.53593749261435; lower left latitude: -6.373536989337675; upper right longitude: -72.44121093249441; upper right latitude: 5.382686176012323. Magnitude range: from 2 to 10. Date & Time(UTC): from 2016-03-01T00:00:00 to 2016-04-17T10:39:04. The result of selecting, adding on the map and customizing the legend is shown on Figure 1. «The Global Biodiversity Information Facility (GBIF) is an international open data infrastructure, funded by governments. It allows anyone, anywhere to access data about all types of life on Earth, shared across national boundaries via the Internet. By encouraging and helping institutions to publish data according to common standards, GBIF enables research not possible before, and informs better decisions to conserve and sustainably use the biological resources of the planet. GBIF operates through a network of nodes, coordinating the biodiversity information facilities of Participant countries and organizations, collaborating with each other and the Secretariat to share skills, experiences and technical capacity. The data selecting from these DBs and mapping the results using OpenWebGIS was discussed in the following articles: "The information tools (data base and GIS) to help paleontologists in their scientific researches", "New feature of OpenWebGIS - mapping data from GBIF, and new Contributor". From the article "200 million years of the dinosaurs life (sauropods) in a few seconds on the map" the following conclusion can be made, that in OpenWebGIS it is possible not only to visualize on the map data from these databases but also analyze it without using other software. Currenlly OpenWebGIS team continues to optimize and increase the convenience to users of selecting and mapping this information. Previously only few fields were sampled from the Paleobiology Database, but now all fields are selected (See Figure 1). In the resulting attribute table of layer from GBIF there are now photos of species (See Figure 2). The sampling process has become more flexible (e.g. it is not necessary to insert the scientific name of species). Using the peculiar features (they use CORS technology) of these DBs, now in OpenWebGIS you have an opportunity to work with them, not only in the online (web) version but also in the local version and Android OpenWebGIS (of course in case your Internet connection is alive). OpenWebGIS team would like to express our clear positive attitude to these databases. They make it possible to select and work with information that is interesting for professionals, scientists and for a wide range of people. Perhaps many of you will be excited by the touch of real and understandable information about the biological past and present of our world. We urge all to use these databases and help them in their development and contributing data. From the programmers' point of view, PaleoBioDB and GBIF have a very convenient, simple and easy-to-use application programming interface (API). Please see information about PaleoBioDB API and GBIF API. We would like to thank PaleoBioDB and GBIF teams. We appreciate their efforts and we are grateful to the creators and participants of these projects. 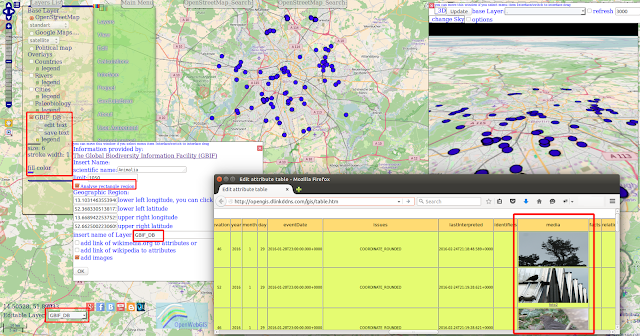 We would like also to mention some new updates in OpenWebGIS. In Android version the opportunity has recently appeared to test the new interface and now it is more convenient to use attribute tables (its size is adaptive now) of the layers. We remind that the last new version app for your mobile devices is always available for downloading at itch.io and at Google Drive. But as a rule there are some older versions at mobango.com, aptoide.com, getjar.com. 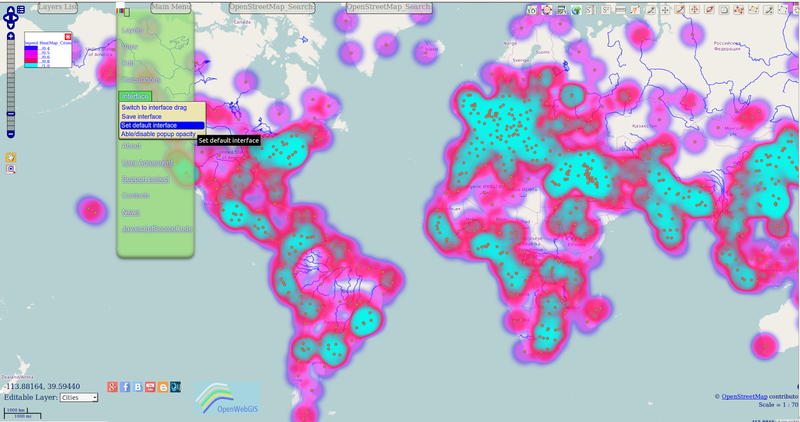 OpenWebGIS app is not published at Google Play so far, but we are planning to do it.